The most fulfilling marriages and love relationships operate not by the old rules, but are custom jobs. For yours to last and thrive in a way that truly fulfills both you and your partner, some brand new – and very specific – skills and attitudes are essential! Most couples assume these come about automatically; but in this era of time – with the volatility of relationships being what it is – they rarely do. In this audiotherapy program, Dr. Broder gives you (and your partner, if you do this program together) a formula to identify and clarify each and every one of your relationship issues – separately or together. You will then be guided step-by-step to apply a fresh array of proven state-of-the-art clinical strategies to your own unique situation. 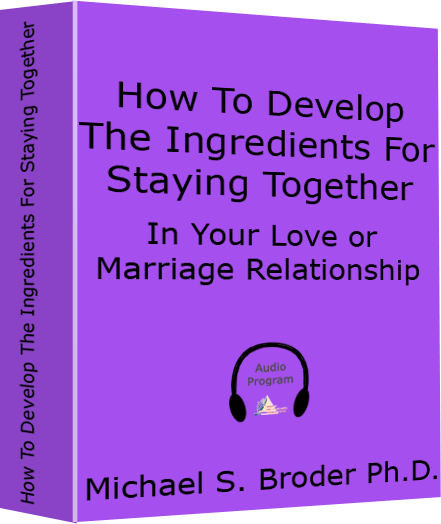 This program contains Dr. Broder’s latest techniques for couples, which also makes it (as many readers have found) an ideal supplement or follow up to his popular book The Art Of Staying Together. This powerful and highly acclaimed audiotherapy self help program in MP-3, CD or cassette format is used by couples around the world to help them resolve their relationship issues and enhance effective communication skills. It is also used, recommended and highly endorsed by therapists everywhere for helping couples stay together happily, increase fulfillment at all levels and to give advice and guidance to partners on how to provide support for each other, along with proven strategies for strengthening marriages whether or not they are showing signs of trouble. It even speaks to partners who need advice on such things as pros and cons of staying together for the kids. Our audio programs, with the exception of MP3 downloads, come with an unconditional money back guarantee that they will deliver the results that you and you alone expect. if for any reason whatsoever, any product you ever order from us does not deliver for you in a way that meets or exceeds your every expectation – simply return it within 60 days of the time you received it for a full refund — No questions asked!